Zachary Herrmann’s “Portrait 3” at the “24th Drawing Show: Feelers”. Artists get the spotlight, but the curator makes the exhibition. It’s the curator who comes up with arguments to defend, themes to flesh out, and formal links around which to install a show. If you just throw a bunch of art up on the wall without a curator’s eye, you’ve likely got visual cacophony. Two venerable local biennials, both juried shows, are up now. The Boston Center for the Arts’ “24th Drawing Show: Feelers,” at the Mills Gallery, has a curator: artist Susan Metrican. “Boston Printmakers 2015 North American Print Biennial,” at Lesley University’s Lunder Arts Center, tapped artist Willie Cole as a juror, but lacks a curator and an overall theme. “Feelers” is by far the more graceful show. That’s not to say the work in the print biennial is bad — Cole has a cunning eye and a pungent sense of humor — or even that it’s poorly installed. There’s just too much going on. If there’s a theme, it’s how wide and varied the field of printmaking has grown. Just as it moves from screenprint to digital print, the show shuttles wildly from satire to landscape, from abstraction to illustration. An exhibition should coalesce into more than the sum of its parts, and this one does not. Metrican, a painter and a member of the artists collaborative kijidome, one of this year’s James & Audrey Foster Prize winners at the Institute of Contemporary Art, started with drawing’s inherent flatness, turning for inspiration to “Flatland,” Edwin Abbott Abbott’s 19th-century sci-fi novel and critique of Victorian society. A flat life is a conscribed life. In “Flatland,” characters are geometric shapes and straight lines, and they explore their limited world with hairy appendages they call “feelers.” And with that, Metrican’s theme gracefully expands from flatness to ways we probe the unknown to emotional sensitivity. It makes for a rather sweet show featuring 56 artists, which she has installed according to form and color: There’s a bucolic green area and a welcoming yellow one, and the whole thing flows without fussily fitting into any boxes. That’s important, because drawing itself rarely fits into a box anymore — it is as much a concept having to do with line and gesture as it is a medium. Metrican makes accommodations, sometimes leaving line and gesture far behind, and it all works as part of the “Feelers” gestalt. For instance, Zachary Herrmann’s “Portrait 3,” which stands in the middle of the gallery, would more likely be seen as a sculpture or a painting than as a drawing. 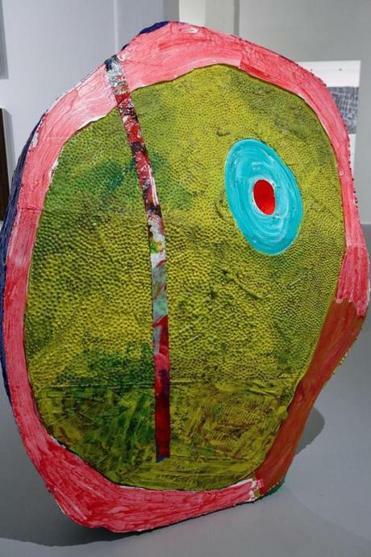 But, like a character in “Flatland,” it’s essentially a circle — more than 5 feet tall, crafted from foam and gleefully painted and textured. Like anything painted with a loose hand and juicy colors, the piece is ripe with feeling — in this case, the moment when embarrassment gives way to pride. Nearby, Eric Stefanski charges his mixed-media painting “Untitled (Blue Gun)” with ambivalence: anxiety in stuttering text, anger in the gouged surface, and serenity in the washes of blue that coat it. Actual drawings do anchor the show, and remind us from where this whole weird world sprang. Jenene Nagy’s jaw-dropping “p5,” obsessively covered in graphite, features geometric sections delineated by the nature of her repeated mark. Opaque, forbidding, and magnetic, it’s an abstract equivalent to Darth Vader. Ariel Freiberg’s “Feminine Delinquency,” an oversize charcoal drawing of a woman’s mouth on a torn circle of paper, fits the “Feelers” bill in every way: drawn, flat, shaped, sensing, plump with feeling. Metrican has cleverly mounted it high on the wall, as if it’s blowing us kisses. Why would such a catchall theme work better than no theme at all? Partly, the drawing show holds together because drawing has become so open-ended. Printmaking, even as it expands into filmic and digital realms, remains steadfastly technical. Every piece in the biennial has a “gee whiz, how’d the artist do that?” quality that highlights technical finesse. Concept, in this show, is utterly secondary. These works — more than 80 — all have ideas driving them, but medium alone is not enough to connect them. Big picture aside, many smaller pictures here deserve attention. 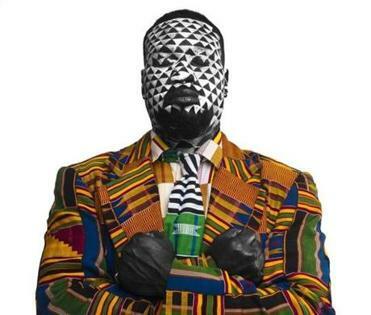 Stanley Squirewell’s “Algorithmic,” a color photograph, depicts a black man with his face painted in geometric black-and-white, in a suit recalling West African kente cloth. Rhythmic pattern covers him; bold and strong as a mythic god, he nonetheless wears the uniform of a businessman. Another photo-based work, Judy Bergman Hochberg’s photogravure “The Cornfield,” casts a light freighted with the darkness of an oncoming storm on the deserted crop. Donald Furst’s “3:20 a.m.” depicting an illuminated tattoo parlor sign, does everything a mezzotint should, crafting velvety atmosphere from the softest inky gradations. On the sardonic side, Mike Elko’s screenprint “Grandma’s Raisin-Radium Muffins” has an eerie glow, and Matthew Egan’s lithograph of an animistic meal, “Dinner Party,” ties feasting with slaughter. These last two should have hung together. That’s where a conversation begins.